As you know, Michigan State University Extension recently took part in a U. S. Department of Agriculture civil rights audit. They occur once every four or five years. I’ve been involved in four of these – twice as a regional director and now twice as director of Extension – the last time was in 2004. I’m very proud of the work we are doing to demographically reach target audiences. We are reaching the audiences in close demographic comparison in categories of race and gender. You may be surprised by some of the data. For example, of youth participants in the Children and Youth Institute, only 9 percent live on farms. This differs from the popular perception that 4-H only serves farm youth. The data shows that we meet people where the need is great with health and nutrition information as well as financial and money management. The auditors were thrilled with the way we presented the data. I’d like to thank the many staff involved in helping to gather the data and put it into an understandable format. They include Nancy Axtell, Jessica Nakfour, Jean Schueller, Bruce Haas, Cheryl Peters, Olga Santiago, Kathy Raphael, Mary Wilson, Gloria Ellerhorst, Emily Proctor, Christi Sovis, Doug Brinklow, Michelle Lavra, Marian Reiter, Beth Stuever, Julie Chapin, Dave Ivan, Dawn Contreras, Paul Putnam, Jim Lucas, Pat Cudney, Kelley Hiemstra, Michael Krauch, Shari Spoelman, Don Lehman, Betty Blase, Deanna East, Joe Bixler, Marie Ruemenapp, Matt Shane and Ginger Hentz. Without your hard work for months in advance of this review, we could not have done it. The auditors took all of that data and examined it. They also went out into the field to get more information from you. They were pleased with everyone’s availability to meet with the reviewers and with the helpfulness of the staff in giving them access to our information – as I am! They combined the data and the information to give us feedback on a few things we can work on. In working with people, we need to diversify our overall employment makeup throughout the organization as well as work to integrate and diversify membership within 4-H clubs and broaden the programming we’re doing with female farm operators. We need to expand our nutrition programming to include demonstrated outreach with other agencies. Consistency is something that came up in several areas. We need to be consistent in demonstrating the work we do in each county through data, and train staff in the method for collecting that data. We need to update our race/ethnicity/gender data collection forms to include the recommended way to collect race and ethnicity data. We need to use the statement concerning accommodations consistently and ensure consistency with regard to civil rights training. We need to ensure that brochures and other promotional pieces have pictorial displays of diverse populations. I know this is something that we’ve strived to do and we will continue to focus on it. In addition, we need to revise our Civil Rights Plan and education to include the Genetic Information Nondiscrimination Act and the Americans with Disabilities Act as amended. The auditors had many good things to say about our accomplishments. They praised our work with Tribal Communities as well as the work we’re doing with prisons. They believe that our work translating program documents and brochures and making them available in Spanish, Arabic and Braille is outstanding. They haven’t seen as much of that in other states. They believe we have great outreach through the Supplemental Nutrition Assistance Program – Education (SNAP-ED) and the Expanded Food and Nutrition Education Program (EFNEP). They believe we have strong nutrition programming at the grass roots level. Also, please keep checking back to the MSU Extension Civil Rights site for additional materials that will be added: http://od.msue.msu.edu/civil_rights_diversity_multiculturalism. Once again, thank you, everyone, for all of your hard work in making the USDA audit a powerful learning experience for all of us! When we mark our time in years, it seems as inappropriately scaled as documenting nutrition in units of feasts. Normally we don’t sit down to a meal with several varieties of meats, three different vegetable dishes and salads, four starches, and a smorgasbord of deserts. But that’s what many families have done over this holiday season. Compared with a holiday feast, the cold lunch we take to work on a Monday morning seems like an insignificant morsel, hardly worth considering. Yet by Monday noon, that morsel seems pretty important and filling. And by Monday afternoon, having consumed that meager lunch, we’re able to focus on whatever is important in our work life instead of being distracted by a growling stomach. At the end of a year, the work that has happened over the course of the year, the events we’ve experienced, the insights we’ve gained, and the goals we’ve achieved are as overwhelming in reflection as the lingering effects of a holiday feast at bedtime. Rather than struggle to document the fullness of 2013, I’d like to select three memories that characterize the year for me. And just as memories of a delicious ham or those homemade noodles promise some fantastic meal creations from leftovers, these three memories give me reason to anticipate some outstanding opportunities for Michigan State University Extension in the New Year. What’s Now? What’s Next? Dean Fred Poston decided early on in his second tenure as Dean of the College of Agriculture and Natural Resources (CANR), that it would be beneficial for the college and for our stakeholders to hold a series of town hall events around the state. As he opened each of the 13 sessions we held, he explained that having come through a tough time of budget reductions, restructuring and leadership changes, it was important for the college leaders to reconnect with people across the state who care about the role of the CANR in Michigan’s future. Dean Poston asked Senior Associate Dean and Director of MSU AgBioResearch Doug Buhler, CANR Associate Dean Kelly Millenbah, and me, as Director of MSU Extension to join him on a panel that would respond to questions and suggestions from people who attended these sessions. There’s a great deal for us to learn from the What’s Now? What’s Next? (WNWN) sessions, and I’m sure Dean Poston will be communicating some of those insights in the new year. For me, the most striking message from these sessions was the simple fact that they happened. In MSU Extension, we’re accustomed to the idea that university leaders should be engaged with the public and seek out public thoughts on our mission and how we carry out our mission. And in the CANR, that’s a common understanding as well. Yet at each event, participants consistently voiced their gratitude that we cared enough about what they thought to ask them to meet with us and to share their thoughts, frustrations, and appreciation for the work of MSU and the CANR. When you hear people express gratitude for showing them respect, it’s clear to me that they haven’t always felt that respect from us. It also tells me that they acknowledge that this isn’t something that they expect to experience from other institutions of higher education in the state. For the year 2014, the lesson of WNWN is that we must continue to engage with the people we serve, asking for their thoughts on needs and priorities, and sharing with them how we’ve succeeded and how we may have fallen short in our expectations. One way that we will show respect to the people we serve is by asking them to celebrate the Centennial of the Smith-Lever Act by sharing their stories with us, stories that tell of their lives, challenges and successes, and in their telling, shed some light on MSU Extension as well. 2. 21st Century Extension Professional. During Fall Extension Conference, we were fortunate to hear from Dr. Chuck Hibberd, Dean of Extension at the University of Nebraska-Lincoln who described a study he led on what skills and attributes will be needed for effective Cooperative Extension Professionals in the 21st Century. I know some of the participants in the conference thought we had erred by asking Dr. Hibberd to address the full conference, reasoning that most people are NOT involved in selecting candidates for open positions. But the lessons of the study go well beyond decisions we make about whom to hire, and extend to include our current colleagues. It is as helpful to ask the question “how well do our skill sets match these needs today” as it is to ask how we can recruit new employees with those skills. For me, the greatest insight from the 21st Century Extension Professional study was in reflecting on what makes an Extension professional unique. When you take all of the skills and attributes that were identified as being of greatest importance in the study, I still think you can summarize them in two traits of Extension professionals that I admire and that motivate me every day: First, effective Extension professionals are innately curious, motivated to learn more about anything they encounter, and especially those topics related to their area of expertise. Their curiosity positions them well to remain up to date in their subject, and to incorporate new scientific findings as they develop. Second, effective Extension professionals are compelled to teach. There is an inner desire among Extension professionals to explain things to people. Put them in a group where someone asks a question, and an Extension professional will be quick to offer an explanation or to engage someone in the group who has insights into the question to get their explanation out for all to learn. In looking ahead for 2014, one of our great opportunities will be to ask how we can better serve our staff and faculty with professional development opportunities that will stretch their skill sets, increase their effectiveness, and ultimately feed those twin motivations of curiosity and pedagogy that help each of us to succeed. 3. An honoring ceremony for retired Congressman Dale Kildee. Following the closing session of Fall Extension Conference in October, I drove to Mt. Pleasant, Michigan, where I had been invited to attend a ceremony held by the United Tribes of Michigan (UTM). The previous night we had honored Frank Ettawageshik, Executive Director of UTM with the prestigious Friend of Extension award from the Michigan Alpha Psi Chapter of Epsilon Sigma Phi in recognition of Frank’s support for our Building Strong Sovereign Nations program, and his leadership on the board of the Great Lakes Leadership Academy. At the honoring ceremony in Mt. Pleasant, Frank was the first of many tribal leaders from Michigan who spoke of the contributions of Congressman Kildee on behalf of the sovereign rights of tribal members. Congressman Kildee became known in the Michigan Legislature and in the U.S. Congress as an expert and advocate for the rights of American Indian tribes within Michigan and the United States. It was a moving event to hear so many tribal leaders speak of his importance to the advances made in governance and economic development in Michigan’s tribes over the past 37 years. What struck me most that night was to hear each leader speak to the value of the Michigan Indian Tuition Waiver (MITW), a right established by legislation then-Michigan House member Kildee framed in the 1970’s and then led its passage in 1976. The MITW is “a program enacted by Public Act 174 of 1976, which waives the tuition costs for eligible Native Americans in public community colleges or universities within Michigan.” Based on the high percentage of leaders in the ceremony who had used this benefit to achieve their own higher education goals, and given the success of tribal governments in creating new economic opportunities in their communities over the past 37 years, it seems clear that this single act of legislation has contributed greatly to enhanced prosperity for tribal members in Michigan. I witnessed further evidence of tribal growth and transformation in a conference held in East Lansing in March, titled “A conversation about Michigan Indian Education and Michigan State University.” Several of our MSU Extension colleagues participated in this conference, including Emily Proctor, Barb Smutek, and Dionardo Pizaña. Many of the participants in this conference were from a younger generation than those involved in the honoring ceremony for Congressman Kildee. Yet the impact of educational opportunity on the development of leadership among tribal communities was powerfully evident in the conversations that ensued at the conference. Our popular culture sends mixed messages about the traditions and future of the descendants of North America’s native peoples. It’s difficult to find the positive outlook and promising future in our media that these two events showcased for me. If you ever need a strong dose of hope for humanity and our country’s future, connecting with leaders in Michigan’s tribal communities will give you all you need. For 2014, we have some great opportunities to build on programming that Emily, Barb, Dionardo, and other MSU Extension colleagues have pioneered with Michigan’s tribal communities. Whether it is the workshops these three led on doing the work of Extension in tribal communities (they promise more in 2014), or programming partnerships with tribal governments in health and nutrition, tribal governance, and community food systems, we have tremendous opportunities to contribute further to the growth and development of Michigan’s tribal communities. And as we build on these opportunities, we will also challenge ourselves to address needs in other ethnically- and racially-distinct communities that have not been served as well by public institutions in the past. That challenge builds on the themes that have emerged from the What’s Now? What’s Next? town hall meetings and gives us tremendous opportunities to grow into the skills we all need to be effective Extension professionals in the 21st Century. Tagged as 21st century extension professional, AgBioResearch, alpha psi, barb smutek, building strong sovereign nations, canr, centennial of the smith-lever act, chuck hibberd, college of agriculture and natural resources, dale kildee, dionardo pizana, doug buhler, emily proctor, epsilon sigma phi, frank ettawageshik, fred poston, great lakes leadership academy, kelly millenbah, michigan indian tuition waiver, michigan state, michigan state university, mitw, msu, msu extension, msue, smith-lever act of 1914, united tribes of michigan, university of nebraska-lincoln, utm, what's now? what's next? 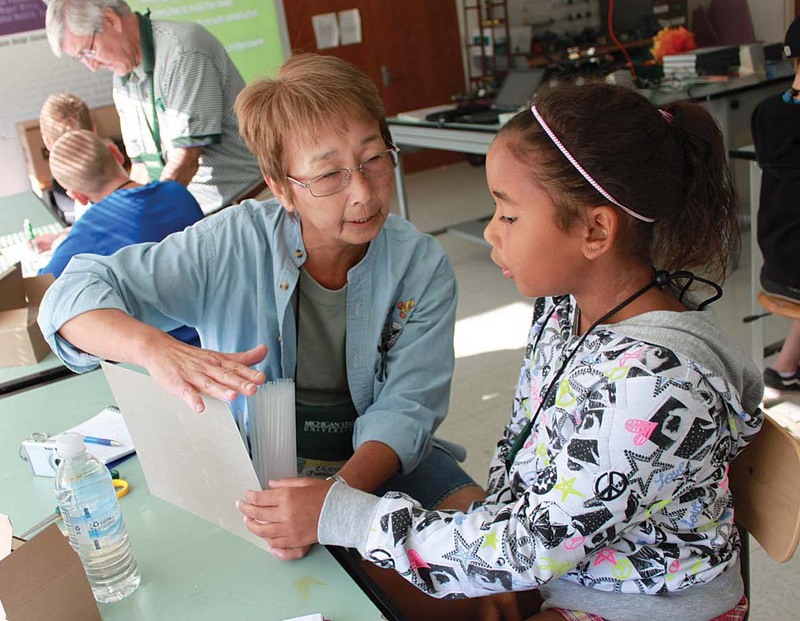 Grandparents University, scheduled for June 24–26, provides an opportunity for 8- to 12-year-olds to experience life on the Michigan State University campus. They get to live on campus, eat where the college students eat and even take classes. An added enhancement is that they do it all with their grandparent or favorite adult. Besides sparking an interest in potential future Spartans, the event brings alumni back to campus, providing an intergenerational experience that creates a connection between the participants and MSU. More than 1,000 participants from 35 states and Canada attended the 2013 Grandparents University. A post-event survey reflected extremely positive reviews. Kathryn Reed, assistant director of alumni relations and special events in the College of Agriculture and Natural Resources, invited me to encourage you to be a part of this unique experience by lending your expertise to presenting a session. Many who take part say that participating in Grandparents University is one of their favorite activities. It’s one of those experiences that you’ve heard about – the kind that after it’s over, people overwhelmingly say they get back more than they give. You’ll also gain professional experience. It’s an opportunity to hone teaching skills and materials, to learn public opinion on the topic you cover and to think about your subject from a different standpoint due to the diversity of the participants. Laurie normally works with youth using the MSU Extension 4-H-created Spartan Dollars and Cents budgeting simulation. The Grandparents University session allowed her to use the simulation with both adults and children. “Although my target audience is usually youth, this session had the additional outcome that the adults got a lot out of it, too, “said Laurie. The adults found it challenging in the simulation to have to stick with a limited budget. Many remarked that it helped them to relate to different budget scenarios that others might be grappling with. For example, some found they could not afford to purchase health care insurance within the budget and a discussion took place about the challenges of this arrangement. Laurie also said that taking part in Grandparents University gave her a different perspective. “It was neat to be a part of a program that involved so many different departments and units, including Extension, at the University. It was a great team effort,” she said. This year Extension educator Frank Cox will join Laurie in presenting Spartan Dollars and Sense. They’ll also present the Wonderful World of Work in which the generations will learn from each other about work. Grandparents University 2011 participants take part in one of the many sessions offered at the Michigan State University annual event. Courtesy of Grandparents University. If you decide to present, you’ll need to target your 90-minute session to the 8- to 12-year-old audience, making sure that what you present is a fun, interactive, hands-on lesson that holds kids’ interest. You don’t have to be limited to the classroom. You can conduct your session in a lab, on the farm or another location. Need more than 90 minutes? You can sign up for two 90-minute sessions, given as Part I and Part II. It’s not necessary to reinvent the wheel. Why not just adapt a program or outreach effort you currently teach? Last year, in addition to Laurie, Extension educators Jed Jaworski, Georgia Peterson, Dixie Sandborn and Jessica Wright participated. Charles Gould, Paul Gross, Dennis Pennington and Mark Seamon have participated for years but were unable to present in 2013. These four have already committed for 2014. Others who have presented in the past include Laura Allen, Bindu Bhakta, Constance Costner, Dale Elsoff, Andrea Grix, Vanessa Holmes, Betsy Knox, LuAnne Kozma, Cyndi Mark, Emily Proctor, Kama Ross, Erica Tobe and Sheila Urban Smith. By the way, several faculty members on campus have used their Grandparents University sessions in grant applications when an outreach or other similar component is required. In the program Relationship Building for Better Partnerships: Anishinaabe Tribes and MSU Extension, Michigan State University Extension staff members Dionardo Pizaña, Emily Proctor and Barb Smutek facilitate trainings with members of the Anishinaabe Tribes. I’ve written about the program in the Spotlight on April 11 and more recently on August 8. There’s still space for the next round of workshops. The 3-part series provides a unique opportunity for the Bay Mills Indian Community and MSU Extension to learn from each other, build working relationships and plan some collaborative projects together. This series takes place in Brimley Oct. 10, Oct. 30 and Nov. 14. Register here. Several months ago, I wrote a story about a new program (Relationship Building for Better Partnerships: Anishinaabe Tribes and MSU Extension) developed by three of our Michigan State University Extension colleagues about building strong and lasting relationships with Michigan tribal nations. Extension staff members Barbara Smutek, Emily Proctor and Dionardo Pizaña have offered a three-session program in St. Ignace, are currently offering a second series in Hannahville, and are scheduled to offer a third session in Brimley later this year. Barbara and Emily presented an update on the workshop series on the MSU Extension Update Webinar on Monday, Aug. 5. Unfortunately, we had some technical difficulties that made it difficult to hear Barbara’s portion of the presentation. She has graciously offered to record that presentation with the sound issues corrected, so I’d like to call this to your attention. You can hear a recording of her presentation at https://connect.msu.edu/p9sciguxeu1/. Just as important, I would like to encourage you to seek out an opportunity to participate in this program in the future. Tribal partnerships have already served us well in reaching audiences we have not served in the past, and as more of us learn about the unique opportunities presented by working with tribal members, we can achieve even more impacts in their communities. The current workshop series in Hannahville has two sessions remaining, one on Aug. 21 and the other on Sept.18. And the next series, to be held with the Bay Mills Indian Community will take place in Brimley on Oct. 10, Oct. 30 and Nov. 14. Future series are in the plans for the Traverse City area and southeast Michigan. Michigan State University Extension is partnering to improve health in tribal nations. Some of our MSU Extension colleagues work through the Geriatric Education Center of Michigan (GECM), a federally funded, statewide consortium of universities, hospitals and government agencies. The center, administratively located at MSU, trains health professionals and others to deliver better care to older adults. Through the center, the Northern Michigan Team focuses on elders in the American Indian community. The team includes Extension health and nutrition educator Emily Proctor, a member of the Little Traverse Bay Band of Odawa Indians and a tribal liaison for MSU Extension; Linda Cronk, Extension health and nutrition educator; Beth Eisch, registered nurse in the Area Agency on Aging of Northwest Michigan; Dr. Lynn Swan, physician in the Munson Family Practice Center and MSU assistant professor in the Department of Family Medicine; and Dr. Cheryl Peters, Extension evaluation specialist. The team partners with tribal nations and community organizations to offer tribal government employees an opportunity to obtain continuing education credits through various elder care modules. The modules train individuals on topics that include caring for the caregiver, substance abuse and mental health issues in older adults, health literacy for older adults, oral health and more. Not intended as typical lecture instruction, the multidisciplinary modules involve sharing experiences and learning from each other. For more information on the GECM, visit http://gecm.msu.edu/.